Late last night the Helsinki city council rejected a proposal to fund a new Guggenheim Helsinki Museum; the final tally was 53 to 32. Despite its initial failures in securing funding from the Finnish government, up until this vote the Helsinki Guggenheim Museum was still a real possibility. However, it seems this rejection has finally capped years of controversy. 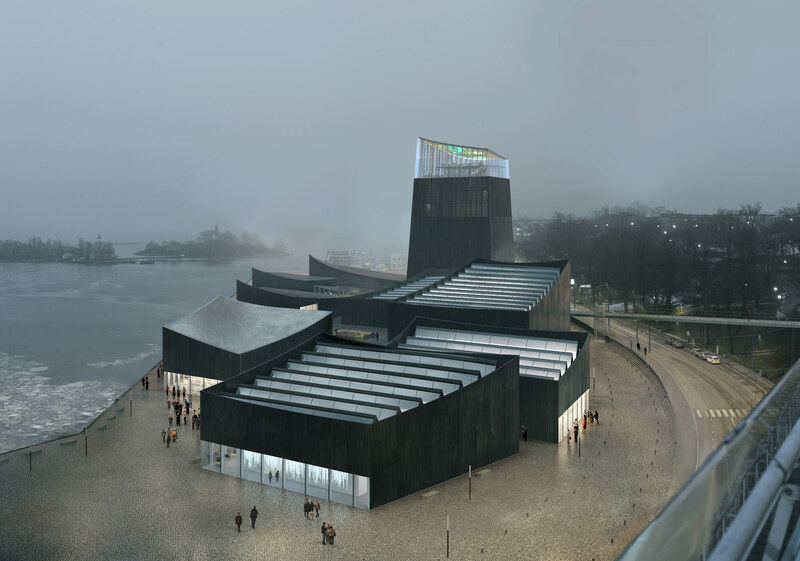 First proposed in 2011, the Guggenheim Helsinki has been the subject of years of back-and-forth between the Solomon R. Guggenheim Foundation and the Finnish government over who would pay for the proposed museum’s cost and maintenance. Much like the Guggenheim Bilbao, the museum would’ve featured parts of the foundation’s modern art collection on a rotating basis, along with works by local artists. The foundation argued that tourism revenue would outweigh the government’s funding. However, critics argued that the Guggenheim Foundation was seeking to spread its international brand at the unfair expense of Finnish taxpayers (and that Helsinki already had a robust arts scene). In 2014, the foundation launched an international competition to pick a design and win over the Finns in the process. Simultaneously, a competition formed by the proposed museum’s critics, dubbed The Next Helsinki, sought alternative proposals. The Next Helsinki competition announced its winners in April, 2015; that same June the Guggenheim named Paris-based Moreau Kusunoki Architectes as their winner. Then, in September 2016, the incumbent and fiscally conservative Finnish government said that the museum’s costs were too high—an estimated $138 million. The project was revived when, on this past November 11, Helsinki’s city board members narrowly gave it the greenlight with a new funding scheme: The city would cough up approximately $85 million while the Guggenheim Helsinki foundation would provide the rest. However, their vote—which was a marginal 8 to 7—was not binding. Last night’s vote from the 85-member strong city council, however, has nixed that. Biennale Books co-founder Laura Iloniemi told The Architect’s Newspaper that the city councilor’s concerns included the museum’s appearance (“coal pile,” “bunker,” “inappropriate for the site”), the value of the proposed harbor site, the Guggenheim’s association with workers’ rights issues in Abu Dhabi (the location of one of their outposts), doubts about the Guggenheim’s tourism forecasts, and frustration with the foundation’s lack of transparency and forceful lobbying. Those in favor said the Guggenheim Helsinki was a unique opportunity that would increase tourism and the city’s cultural offerings while forging a stronger trans-Atlantic connection. Cover Art: Klas Eriksson, Forza Rosa. Fluff Photo: Annika von Hausswolf. Even as the Guggenheim Helsinki fades away, it leaves behind a legacy of alternative proposals: Urban Research, the imprint of Next Helsinki co-organizer Terreform, has announced the publication of a book featuring the Next Helsinki competition’s designs. 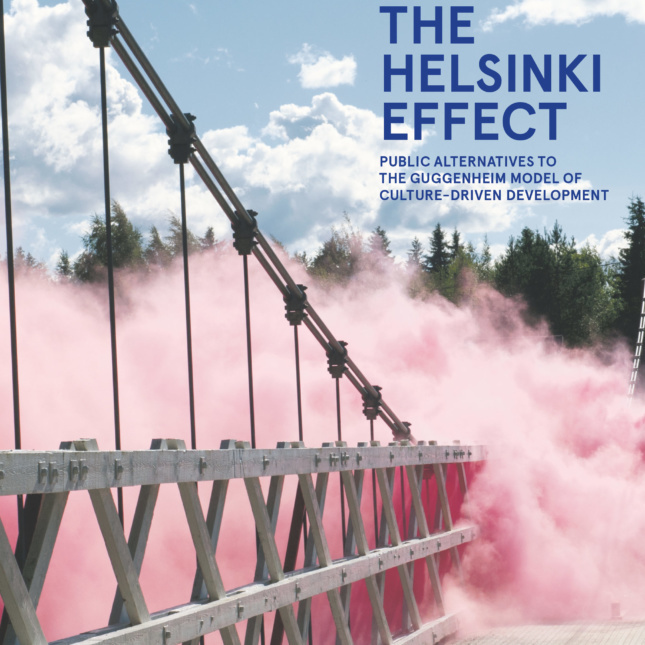 Dubbed The Helsinki Effect: Public Alternatives to the Guggenheim Model of Culture-Driven Development, it’s due out in December and available for pre-order. The Helsinki Effect was edited by Checkpoint Helsinki board member Terike Haapoja, G.U.L.F. editor Andrew Ross, and Terreform founder Michael Sorkin; each editor has also contributed a chapter (Sorkin’s is titled “WALMART COMES TO HELSINKI”). It looks at the submissions as a way of enlivening public discourse on “the role of culture in civic health and economic development,” the consequences of which stretch beyond Finland and its capital. The Helsinki Effect also includes essays from leading urbanists, artists, and architects that touch on The Next Helsinki competition’s significance to contemporary urban principles.